Beneath the stylish exterior of the N56V, there lies a sleeping beast; a beast with a roar louder than any others that lay before it. That beast is a brand new Intel Core i7-3720QM 2.6GHz processor, one of the chip giant's third generation Core CPUs. Codenamed Ivy Bridge, Intel's latest offering uses 22nm technology, resulting in around 20 per cent more processor performance, while at the same time using 20 per cent less average power than its Sandy Bridge (the second-generation) equivalent. Intel has described the generation jump as its "fastest ramp ever". And, after living with the Asus N56V, we're not going to disagree. The game action is helped by the inclusion of upgraded Intel HD 4000 graphics but also, more importantly, because the Asus N56V is packing dedicated graphics courtesy of Nvidia's GeForce GT 630M GPU. It also means a better battery life. Although far from the best score we've ever recorded for our intense battery stress test - at just over three hours - this represents a life expectancy of over four hours in a real world scenario which, for a machine that borders on being a 'desktop replacement', is more than adequate. The actual chip on board the Asus pre-production model is the i7-3720QM. It's a quad-core monster running at 2.6GHz (or up to 3.4GHz using Intel's built-in Turbo Boost 2.0 technology), with eight threads in total. This allows each core to handle two tasks at a time. We tried - and failed - to make the N56V stutter to a halt. It had absolutely no issue running a high-definition video, streaming audio from the web, having multiple editing programs open and functioning, and all the while having a graphics hungry game running in the background. As mentioned, the Asus N56V that we got our paws on was an early model, although we hope that the manufacturer doesn't tinker with the design and build too much. That's because, as well as being an absolute behemoth in terms of performance and power, the N56V is a lovely looking machine that eludes to the slickness held within. The brushed metallic aluminium alloy lid, complete with a luminous Asus logo, opens to reveal a spacious black-keyed isolated keyboard, complete with a trimmed down number pad, sitting on a silver panel. 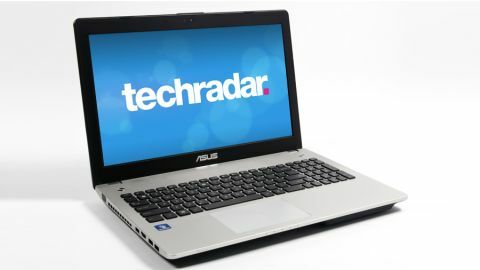 Around the shiny metallic power button, and its sound control neighbour, is a dotted circle design that tips its cap firmly in the direction of the Asus Transformer Prime and the company's Zenbook Ultrabook range. In short, it looks cool. The trackpad is large, although devoid of any separate physical buttons. However, there is a clear indicator separating right from left and the 'click anywhere' philosophy feels natural after a just a short period of use. Multitouch gestures, such as scrolling and pinch to zoom, are also supported. The keyboard, as well as being commodious, is also incredibly comfortable to type on, with a MacBook-esque soft resistance that makes tapping away for long time frames amiable. The matte display of the N56V is 15.6 inches and has a Full HD 1080p resolution. Combined with the processing power of the laptop, which smashes through HD video files and rich graphics games with ease, images look incredibly sharp and viewing angles are pretty good as well. Text can look small using the native resolution but there is always the option of increasing the default font. Sound quality is also fantastic, either from the built-in speakers (nicely hidden by the circular dot pattern) or via the 3.5mm jack thanks to the Bang & Olufsen ICEpower audio that's on board. Connectivity is also a strong point. The N56V is especially generous on the USB 3.0 front, with four ports on offer - two on each side. You'll also find a HDMI port, an Ethernet one and a VGA connector. The optical drive on the model we tested was a Blu-ray one, although we'd expect Asus to offer a DVD option on launch to keep the price down as well. Obviously, we'd highly recommend that you go out and spend your hard earned pennies on the Asus N56V right away - if only it was that simple. Unfortunately though, we may be in for a little wait before it is finally signed off by the powers that be at Asus and it hits the shops. We're confident, however, that when it does - Asus is on to a winner. Not only is its Ivy Bridge debutant the most impressive laptop that we've tested in a long time when it comes to performance, it's also a machine that is easy on the eye, with a great build quality, brilliant multimedia features and a superbly crisp display. Ladies and gentlemen, the Ivy Bridge bandwagon has finally rolled into town and, if Asus' early intentions are anything to go by - it's going to be an exciting ride.